Frodo Baggins (b. TA 2968; 1368 in Shire Reckoning) was a Hobbit of the Shire, who, like Bilbo, undertook a perilous quest. In Frodo’s case, his journey brought him to Mount Doom to destroy the One Ring, which Bilbo had found during the Quest of Erebor. Frodo was the only son of Drogo Baggins and Primula Brandybuck; upon their death in a boating accident, Frodo was adopted by Bilbo Baggins, who lived in Bag End. When Bilbo left the Shire in 3001, everything in Bag End – including the One Ring – went to Frodo. In 3018, Frodo set out to Rivendell using the name Underhill (at Gandalf’s advice), seeking escape from the Nazgûl. Accompanying him were the Hobbits Peregrin Took, Samwise Gamgee, and Meriadoc Brandybuck; along the way, they encountered the Ranger Strider, who served as their guide. While camped at Amon Sûl, Frodo was stabbed by the Witch King of Angmar, the Lord of the Nazgûl; with the aid of his companions and the Elf Glorfindel, he was safely escorted to Rivendell, where he was treated by Lord Elrond (though the wound would never fully heal) and later reunited with Gandalf. While in Rivendell, Frodo volunteered during the Council of Elrond to take the One Ring into Mordor. He set out with eight others – Sam, Merry, Pippin; the Men Aragorn and Boromir; Legolas of Mirkwood; Gimli son of Gloin; and Gandalf – and collectively, they were known as the Fellowship of the Ring. They traveled through the Mines of Moria, where Frodo was nearly incapacitated by a cave troll; though he was protected by a shirt of mithril. Soon after, Gandalf fell protecting the Fellowship from the Balrog of Moria. Without him, the Company pushed on into Lothlórien, where Frodo saw in the Mirror of Galadriel the fate of Middle-earth, should he fail his quest. 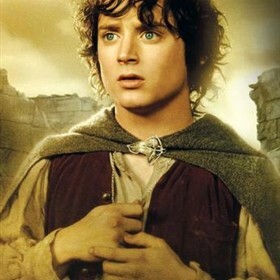 Upon reaching Sammath Naur, Frodo had a change of heart and claimed the Ring for himself. Gollum, in an attempt to reclaim his Precious, bit off Frodo’s finger; in his excitement, he tumbled off the edge of the cliff and fell – with the Ring – into the pit of fire, thus fulfilling the Quest. Following the War of the Ring, Frodo became Mayor of Michel Delving for a time (November 3019 – Midyear’s Day 3020). He also recorded his account of the War of the Ring in the Red Book of Westmarch, which also contained Bilbo’s writings and his account of the Quest of Erebor. But his physical wounds and the discontent he felt in his heart and mind were too great; thus, he sailed – at the age of fifty-two on September 22, 1421 Shire Reckoning – with Bilbo over the Sea with the Last Riding of the Keepers of the Rings, leaving everything to Samwise Gamgee. Also known as: the Ring-bearer, Frodo of the Nine-Fingers, and Nine-fingered Frodo.